Pneumatic micro-actuators present unique advantages such as high force to volume ratio, tunable to get desired force vs displacement characteristics, free from high voltages, to list a few. Among several types of pneumatic actuators bellow type actuators presented recently are more conducive for MEMS fabrication. 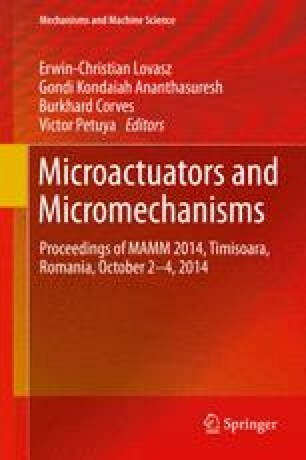 This paper presents extensive parametric analysis of these actuators to finally generate design and synthesis curves in terms of non-dimensional parameters. Analysis is carried out with finite element method (FEM); based on results and physical insights, non-dimensional parameter for synthesis are identified. Results are presented as design curves in non-dimensional parameters in such a way that based on desired force displacement curve users can converge on parameters without a need for further FEM for their specific case. Results show interesting possibilities of large variety of desired “force-displacement curves” spanning feasible range of parameters. One specific case is considered for fabrication of this bellow type pneumatic actuator and its characterization validates the proposed design analysis. This work is carried out at Suman Mashruwala Advance Micro-engineering Laboratory (http://www.me.iitb.ac.in/~mems) setup with generous donations by Mr. Raj Mashruwala. Authors also acknowledge contribution to this work by Mrs. Himani Shah Modi and Mr Anand Savalia in getting SOI-MUMPS fabrication and initial preparation for characterization. The CNC drilling was carried out at Machine tools laboratory with the help of Mr Pratik Mahambre.